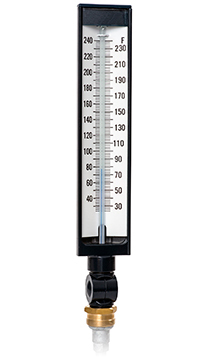 The 9" Model T-571 Multi-Angle Industrial Thermometer has rugged design for durability, with an aluminum case and magnifying acrylic thermometer filled with blue colored organic liquid. The T-571 9" Thermometer can measure temperature with accuracy of ± 1 scale division and is available in 0-100°F or 30-240°F ranges. The temperature assembly can be rotated 90° in either direction with respect to pivot, so it can face left, right, front or back. These units are in stock at our Distribution Center and available for immediate delivery.